The Public Water Supply (PWS) datalayer contains the locations of public community surface and groundwater supply sources and public non-community supply sources as defined in 310 CMR 22.00. The public water supply systems represented in this datalayer are based primarily on information in the DEP’s Water Quality Testing System (WQTS) database. The WQTS database is the Department’s central database for tracking water supply data. The PWS datalayer also contains the locations of proposed wells that have a defined DEP approved wellhead protection area (Zone IIs). Proposed sources are not currently tracked in WQTS. In ArcSDE the layer is named PWSDEP_PT. Community water system means a public water system which serves at least 15 service connections used by year-round residents or regularly serves at least 25 year-round residents. Non-community water system means a public water system that is not a community water system. Non-transient non-community water system or “NTNC” means a public water systems that is not a community water system and that regularly serves at least 25 of the same persons or more approximately four or more days per week, more than six months or 180 days per year, such as a workplace providing water to its employees. Transient non-community water system or “TNC” means a public water system that is not a community water system or a non-transient non-community water system but is a public water system which serves water to 25 different persons at least 60 days of the year. Some examples of these types of systems are: restaurants, motels, camp grounds, parks, golf courses, ski areas and community centers. The DEP PWS datalayer has been compiled from several sources. The original DEP PWS point dataset contained only community water supplies (CWS) which were located and digitized from stable mylar overlays based on USGS topographic quadrangles. In 1993 locations for community and non-community sources were generated from global positioning system (GPS) data collected by the U.S. Environmental Protection Agency (EPA). 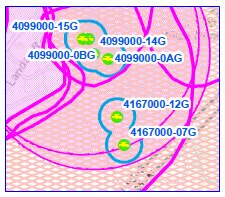 The EPA GPS locations were merged with the existing DEP CWS point data to create the DEP PWS datalayer. From June 1996 to February 1997 the DEP GIS Program and Drinking Water Program (DWP) conducted an intensive update of the PWS datalayer. This update involved several methodologies including map interpolation and GPS field verification. SITE_NAME For community sources this is the source name (S_NAME) as listed in WQTS, for non-community sources this is the public water supply name (PWS_NAME) as listed in the WQTS table. For proposed sources, which are not tracked in WQTS, this is the source name as listed in DEP DWP’s Zone II database (see Related Database Files section below). 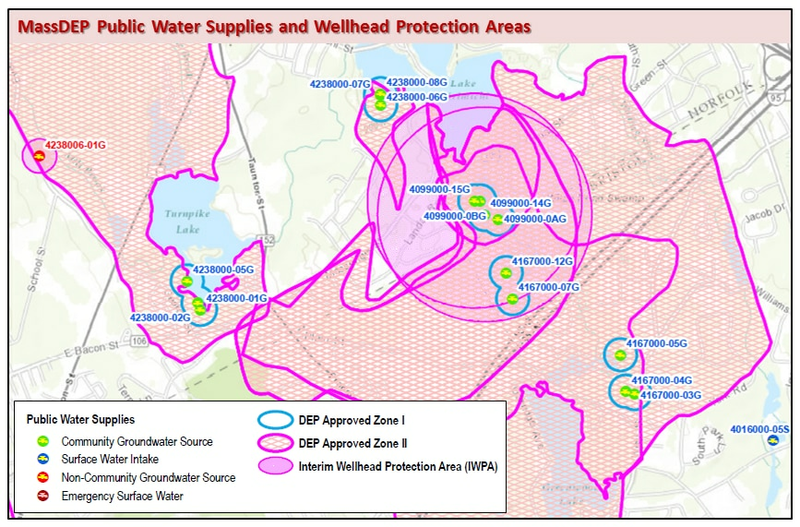 PWS sources with assigned Zone IIs are related to the DEP Approved Wellhead Protection Area (Zone II) datalayer by ZII_NUM. Please note that multiple PWS sources may be associated with one Zone II. Although there is no database relate between the PWS sources and the IWPA datalayer, it is important to always display IWPAs with DEP PWS point data on any map or project. Surface water supply protection areas are related to the PWS surface water source points by SOURCE_ID. Surface water protection areas are assigned to active and inactive surface water sources (TYPE = ‘SW’), but not to emergency surface water sources (TYPE = ‘ESW’). This layer replaces the now discontinued MassDEP ZONEA_POLY, ZONEB_POLY and ZONEC_POLY layers. Contains the watershed extents for all surface water supplies including active, inactive, emergency, sources outside of Massachusetts, watersheds that extend into other states and watersheds of sources from other states that extend into Massachusetts. Surface water intakes on Class B Rivers are not included. Several relatable database files are provided for the purpose of linking DEP PWS source locations with more detailed PWS attribute information and to provide standard DEP GIS metadata. Files are also provided for relating to the MassGIS drainage sub-basins datalayer, for the purpose of defining the contributing watersheds for DEP PWS surface water sources. According to DEP Drinking Water Program a Declassified system is no longer considered a PWS by the DEP, but has not gone through the official process of abandoning all sources. S_AVAILABI Source availability (ACTIVE, INACT, EMERG, ABAND). Abandoned (ABAND) sources are NOT maintained in PWS_DEP. An Active Source means an approved source(s) used for primary or backup purposes to meet consumer demands as necessary. An Inactive source means an approved source(s) which is expected to be off-line for at least one year (12 months). A source may be deemed inactive only upon written approval of the Department. An Emergency source means any source of water used to supplement or temporarily replace a public water system’s active or inactive source(s) when water of sufficient quality or quantity is not available. Sources listed as abandoned (ABAND) in WQTS are removed from the PWS datalayer. Sources in WQTS that are coded as abandoned include both abandoned and decommissioned wells. Abandoned sources are no longer in use or are otherwise unfit for the purposes of water supply. Abandoned sources have been physically disconnected from the distribution system but have not undergone DEP’s formal decommissioning process. Decommissioning requires physically rendering the source incapable of water supply delivery. The DEP GIS Program, in cooperation with DEP Drinking Water Program (DWP) maintains this datalayer. Updates are made on a quarterly (Dec., Mar., June, and Sept.) basis, in accordance with the DWP’s PWS new PWS source approval schedule. The updated datalayer is then shared through MassGIS. As a standard component of this quarterly update, The DEP GIS Program removes abandoned sources in accordance with WQTS. The addition of new PWS sources is dependent on locational information made available by the DEP DWP at the time of quarterly update. Datalayer updates may also include refinements to existing PWS source locations. If you have questions regarding this datalayer, please contact the DEP GIS Program at (617) 556-1115 or (617) 574-6856. General and technical questions regarding public water supplies or Massachusetts drinking water regulations should be directed to the DEP DWP (617) 556-1055. Fill out this form to request this data layer. Open OLIVER to view the PWS data.